The oldest and best known tourist centre in Lanzarote is the dynamic town of Puerto del Carmen with its interesting shops, three impressive Blue Flag beaches, harbour, restaurants and famous nightlife. However, Playa Blanca, the island’s newest resort is catching up fast! It now stretches along 5 miles of uninterrupted coastal walkway from Las Coloradas as far as the Faro de Pechiguera lighthouse. 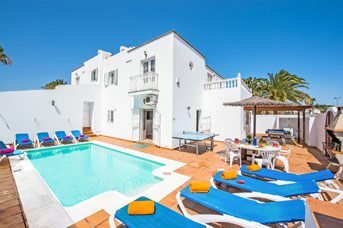 A five minute drive away from the party town of Puerto del Carmen is the small, compact, easy going seaside resort of Matagorda with everything you need for your villa holiday close to hand – perfect if you like gentle days and hectic nights! Puerto Calero on Lanzarote’s warm and sheltered southern coast is all about the Marina, an exclusive and well-established sailing destination that often hosts international events. The attractive marina has a small number of luxury hotels, boutique shops and upmarket waterfront restaurants. Puerto del Carmen is the main tourist town on the island and keeps nearly a million holiday goers happy every year. It is just a half hour drive away from the island’s capital, Arrecife, where half the population of Lanzarote live. This is a small working town that is not dependent on tourism for its living. Arrecife means 'reef' in Spanish, and the name of the town refers to the remarkable coastline, studded with reefs, islets and little natural harbours. The town has an attractive central sandy beach, and a long, inviting promenade. The tallest building on Lanzarote is the Grand Hotel in Arrecife, and it is worth venturing up to the top floor restaurant for marvellous views of the city. The fabulous Puerto Calero Marina was one man’s dream come true. José Calero, known as Pepe, first dreamed of building a Marina that was the last word in luxury more than thirty years ago (his dream included luxury accommodation and a golf course to match – the construction of the golf course is due to start soon, but two out of three is not bad!). His Marina opened in 1989, and ten years later doubled in size. Today it has 450 berths, some big enough for 75 metre super yachts, and some of the some of the world’s most opulent vessels have moored here over the years. Who needs James Bond? You can’t go very far in Lanzarote without becoming aware of the importance of late César Manrique, artist and architect, who was born in Arrecife. He was well ahead of his time, lobbying the planning authority to encourage sympathetic development of tourism - for example, using traditional colours when designing the exteriors of new buildings. His work continues with The César Manrique foundation, based at Manrique's home built on top of a volcanic trail in Taro de Tahiche. This amazing building is open to the public and has an art-gallery of Manrique’s work and his private collection of work by other artists such as Pablo Picasso and Joan Miró. A stunning landscape, sandy beaches and an abundance of restaurants and bars – Lanazarote is the fantastic holiday choice. Puerto Del Carmen and Playa Blanca are two of the island's most popular resorts, where you’ll find most of our villas, some close to the action, others in more secluded spots. 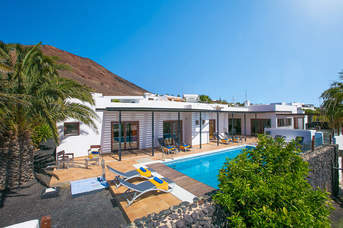 Matagorda is a small, compact, easy going seaside resort, with everything you need for your holiday close to hand, and Puerto Calero is all about the marina, and an ambiance of quiet luxury. Which of these four areas would best suit you, your friends and family? If you can tear yourself away from your villa, you might choose to explore the spectacular volcanic landscapes in Timanfaya National Park or visit the unspoilt white sand beaches of Papagayo – the scenery will take your breath away! We have almost thirty years of experience in helping people like you chose the best possible villa in the right resort for your particular circumstances and preferences, so let us help! The La Asomada is a small village belonging to the municipality of Tias, located at the foot of the volcano Mountain Gaida. 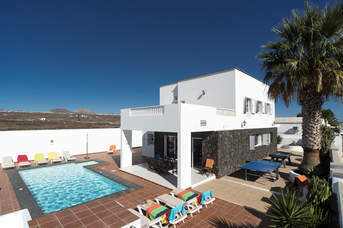 Set on Lanzarote's eastern shoreline, Matagorda is a small, compact, easy going seaside holiday resort, with everything you need close to hand. The busy party town of Puerto del Carmen is just a five minute drive away from your villa so if you like gentle days and hectic nights, you have the best of both worlds. Playa Blanca has developed rapidly and recently to become second only to Playa del Carmen in popularity for holiday makers. 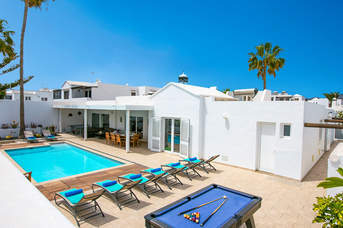 The island’s newest holiday resort is on the southernmost tip of the Spanish island of Lanzarote looking out over the Bocaina Straits to the neighbouring island of Fuerteventura. 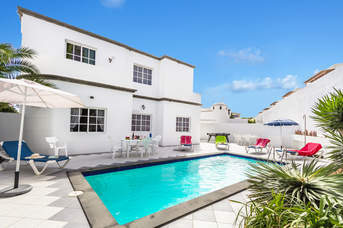 Puerto Calero is a great choice of destination for a villa holiday. Activities here offer a great mix of marine themed fun, whether you choose cruise the waves on a catamaran, explore the depths by submarine or try a spot of deep sea fishing. If you prefer your fish pre-caught there are excellent seafood restaurants to try and if you need a break from the sea, there’s also plenty of designer shopping to enjoy. 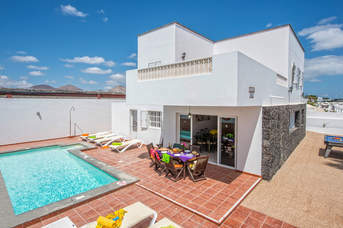 Villa holidays in Puerto del Carmen offer a unique range of holiday activities, whether you fancy exploring the alien volcanic landscape of Timanfanya, National Park, delving deep underground into huge volcanic caverns or partying in a club set within a volcanic cave! After all of this you might feel the need to simply relax on a pristine beach, basking in the sunlight beach, or for a total change of pace, try Wild Rancho Texas Park . There’s so much to do here you’ll be spoilt for choice. Overlooking lively Puerto del Carmen, Tias is Lanzarote’s second largest town is a great choice for a relaxing villa holiday thanks to its laid-back vibe. Dotted with 16th century architecture and hosting many folklore festivals, Tias is not short of Spanish cultural attractions. Of course, you always have the option of heading into Puerto del Carmen for an even greater choice of shops, bars, restaurants and fantastic sandy beaches. There is an 18-hole golf course in between Tias and Puerto del Carmen surrounded by volcanic views – a great place to spend your stay. La Vegueta is a small village set in the countryside. The location is ideal for those looking for a more authentic Spanish experience, and there are many trekking pathways within easy reach amongst the stunning volcanic landscapes. Apart from its mild, year round climate, Lanzarote is blessed with diverse, volcanic lunarscapes and Timanfaya Natural Park in particular, breath-taking views, and unspoilt beaches. The legacy of the late artist, Cesar Manrique remains much in evidence with the resorts developed in his unique 'pueblo' (village) style buildings. Lanzarote also offers an array of quiet hideaway coves, rugged natural beaches and of course the popular tourist zones of Puerto del Carmen and Playa Blanca. The island is suitable for hiring a car in order to explore some, if not all of the places mentioned below. The superb beaches of Lanzarote are the main attraction for the millions of holiday makers who come here to relax every year. They range from the pristine, coffee-coloured sand of Matagorda’s Blue Flag beach to the 'White Beach' that gives Playa Blanca its name. There are three other impressive Blue Flag beaches around Puerto del Carmen. They are all clean and sandy, and well supplied with sun loungers and parasols. The town’s main beach is the Playa Grande which merges with the huge Playa Los Pocillos (Puddle Beach) much loved by windsurfers. To the west of Playa Grande is the Old Town, with its own very small beach, Playa Chica, which gets pretty crowded in the summer. East of Playa Blanca is Playa Dorada set in a sheltered lagoon that is particularly good for small children to potter and paddle. If you head in the other direction you come to Playa Flamingo. The island’s most glorious beaches are at Papagayo which you will find about 1¼ miles east of the Rubicon Marina. This is a series of beaches and coves, which you reach via a dirt track. When La Corona Volcano erupted more than three thousand years ago, it created one of the longest underground volcanic tunnels in the world - over 4 miles long, plus another 1 mile under the sea. César Manrique’s epic Jameos del Agua was created inside this tunnel. And so was another 'must see' experience on the island - La Cueva de los Verdes. About 1¼ miles of this spectacular system of underground grottoes, caves and galleries have been open to the public since 1964, and now has illumination, ambient music and safe pathways. The underwater section known as the Tunnel of Atlantis has not yet been fully explored – so there’s a challenge for you! Even the name is not entirely free of controversy – is it The Greens Cave because of the colour, or because it once belonged to a family called The Greens? When it comes to shopping, Puerto Calero is all about quality, not quantity. You’ll find Armani, Lacoste, DKNY, Ralph Lauren and Hugo Boss along the Paseo de la Moda behind the Marina’s main drag. 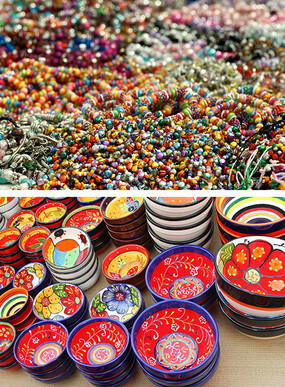 On the harbour-front, you’ve also got a souvenir shop selling pottery, jewellery and art. Don’t forget to check out the perfume store for your favourites, duty-free. The capital, Arrecife is good for shopping with high-end stores and bijou boutiques, but remember the shops close for siesta in the afternoon, so arrive at 10am or 5pm for a leisurely wander without time constraints. The main shopping street, which is a pedestrianised area is León y Castillo (or Calle Real as it’s known locally.) Here you will find clothes shops such as Mango, Zara, Vero Moda and Jack Jones, a variety of shoe shops as well as perfumes and a department store. Jameos del Agua, located between Arrietta and Orzola, was the home and masterpiece of local artist and architect César Manrique, and it opened for the first time in 1966. Not given to undue modesty, Manrique described his creation as 'The most beautiful nightclub in the world', but he did have a point! A 'Jameo' is a volcanic cave with a collapsed roof, and Manrique took an interconnecting series of these, each about four thousand years old, and created an underground entertainment complex built into a sheet of volcanic rock under a beach – which was ambitious by any standards. He created restaurants, cafes and shops and there is a natural Auditorium seating 600 which is renowned for its excellent acoustics. There is a swimming pool and gardens, and an underground salt water lagoon full of blind Albino-white crabs! From calm serenity and small hideaway coves to the lively tourist beaches, Lanzarote has it all. The larger, most important tourist areas boast a coastline full of sandy beaches ideal for snorkelling, swimming or topping up your holiday tan with unforgettable sunsets. All the services you would expect of a large resort are available including pedalos, sunbeds and beachside showers. Or you can try your hand at the various water sports. Travelling south towards the famous volcanic zone, you will find wild sun bleached bays with dramatic backdrops. 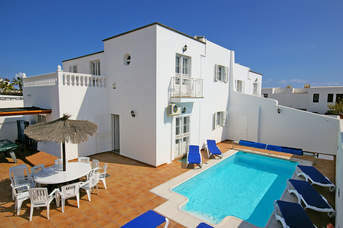 Also offering family friendly, sandy coves, near the popular Playa Blanca resort. On the north east coast close to the sports village of La Santa, Famara is a must for experienced surfers and windsurfers. An untouched 6000m stretch of rugged beach with dangerous under currents making swimming unsafe. Accessible by car. Los Jameos Playa Beach sits between the beaches of Matagorda and Pocillos, by the Seaside Jameos Playa Hotel and Spa. Matagorda Promenade runs parallel to the sand towards Puerto Del Carmen in the west and Arrecife in the east, and is lined with a number of good restaurants and cafes. The promenade is popular with walkers and cyclists, with a cycle lane now added, wanting to explore more of what the area has to offer and admire the view. The promenade provides plenty of parking for your hire car and gently slopes down into the sand. The facilities around the beach are good with sunbeds and parasols available for hire, toilets, a beachwear shop and cash point all easily accessible. The water is also shallow, making it very popular with families. Matagorda Beach is one of the most beautiful beaches in Puerto del Carmen area. Located in the area of Matagorda, this is a calm beach lined with a pretty promenade and an ample selection of restaurants and shops. It also has a parasol and sunbed service. Situated near the popular resort of Costa Teguise a natural beach with a mixture of white sand and small lava stones.373 metres with calm waters. Offering a complete range of services with bars and restaurants close by, sunbeds and parasols to rent. Easy parking. A small beach around 100 yards by 8 yards and set close to the boardwalk with bars and restaurants overlooking the old village. Playa Blanca beach has fine golden sand with calm waters plus. hammocks and sunshades available to rent. Parking is available in the port car park or village. Used by the diving schools because of the abundant marine life, this small 90m bay can be found between the Fariones hotel in Puerto del Carmen and the harbour. A small beach with various water sports on offer, a restaurant and a small terrace where hammocks and sunshades can be rented. To the east of Playa Blanca this 300m man-made, well protected beach with calm waters is a family ideal. Offering a commercial centre, bars, shops and restaurants, jet ski hire and refreshment stands. Found in the Playa Blanca tourist area, this is a pretty white sandy beach overlooked by bars, cafés and shops with a protective rock barrier giving calm waters ideal for swimming and snorkelling, a family favourite. Hammocks and sunshades available for rent, easy parking near the Playa Flamingo hotel. Playa Grande is located in the number one tourist area of Puerto del Carmen and close to all the bars, shops and restaurants. The 1km long, 100 metre wide, sandy beach is also nearby and offers hammocks, showers, easy parking, pedalos, sunshades, first aid and lifeguards. The main Avenida de las Playas promenade makes a pleasant uninterrupted coastal walk passing by smaller, less populated coves ideal for snorkelling or those looking for a little privacy. As close to the planes as you can get, this long stretch of sandy beach is located right along side the airport runway divided by a walkway with access from the Matagorda promenade boasting a cycle lane that leads right to the capital of Arrecife passing local areas with beachside tapas bars and cafés. An untouched wild beach with the odd naturist! Take a picnic no services. Ideal for plane spotters. Located on the way to Matagorda leaving Puerto del Carmen, Playa Pocillos is a wide 1km long open sandy beach. Owing to the breeze, ideal for windsurfing or kiting with an abundance of space for football or volleyball. Close to the bars and restaurants that follow the Avenida de las Playas. Sunbeds available to rent and easy to park the car. High tides create a natural swimming pool. Found in the south of the island near the Papagayo Arena Hotel in Playa Blanca this series of wild fine white sandy beaches is a typical example of beach meets volcano. Rugged landscape with a spectacular volcanic background. There is a 3 euro entry fee and vehicles must be in a supervised parking area. Take your own lunch and refreshments. Whilst the island caters for all tastes and diets, it is in the island's delicious Canarian cuisine that Lanzarote truly comes alive. The typical food of Lanzarote truly represents its geographic location, with influences in taste coming from Spain, Africa and America – with a surprising amount of locals preferring meat to fish, despite the fact that seafood is very close at hand. Whilst goat, beef and rabbit are typical favourites of Lanzarote residents, fresh seafood such as dorada (sea bream, also known as sama), vieja (parrot fish) and cherne (sea bass) are favourites when simply grilled, and served with papas arrugadas - the famous Canarian "wrinkled" potatoes, boiled in salt water and baked. If you fancy trying some local fare away from the restaurants, markets are a great way of really sampling the island's flavour. The market in Arrecife is a favourite with visitors to the island, with local produce of meat, fruits and vegetables readily available. The market runs every Saturday on the south side of the town from 9am until 2pm. For locals of Lanzarote, there are no places better than the Haría and Mancha Blanca markets. Though they are a fair distance from one another, both markets offer a real taste of Spain, with locals shopping for fruit, vegetables, meat and fish, including local specialities such as papas crias and cherry-plum tomatoes. The Haría market operates most Saturdays, and the Mancha Blanca market on Sundays. Growing and rearing food hasn't always been easy for Lanzarote's farmers, and as the Villa Plus guide to Lanzarote. explains, the farmers have to be quite savvy to make the most out of the volcanic, infertile land that the island consists of. As such, the Lanzarote people are proud of their culinary heritage, naming it the Cocina Conaria (The Canarian Kitchen) and the skills of great food production have truly been mastered. Many entirely local dishes are now enjoyed by locals and holidaymakers alike, and have filtered out into the rest of the Western world. Tapas is a great example of this, and you'll find these small plates in most bars on the island. Seafood is popular too, and are often reffered to as Frutas del Mar – fruits of the sea. Conejo - baked or roasted rabbit served with garlic and herbs. Pulpo - sliced octopus with olive oil and a pinch of paprika. 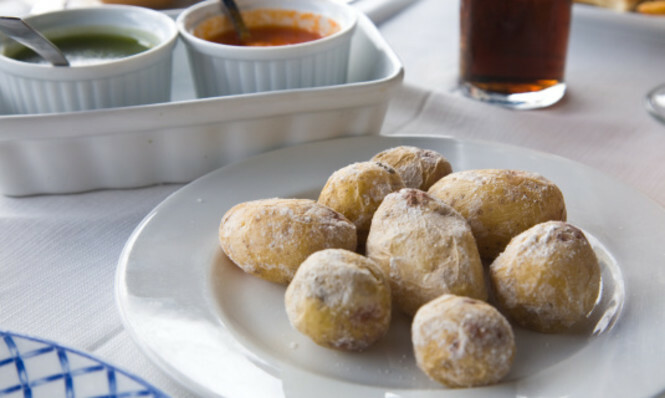 Papas arrugadas with mojos - potatoes with skins boiled in salt water, served with a tasty green herb, garlic and olive oil sauce, or a red oil, vinegar, chilli and pepper spicier sauce. Lentejas - Lentils cooked with pumpkin, bacon, chorizo and peas. There is nothing more traditionally eaten in Lanzarote than the aforementioned papas arrugadas with either a mojo rojo or a mojo verde sauce. These salty potatoes and sauces are enjoyed frequently on the island by locals and visitors alike, and they are one of the easiestCanarian delicacies to recreate at home – either to re-experience the taste after a holiday, or to try it before you go. 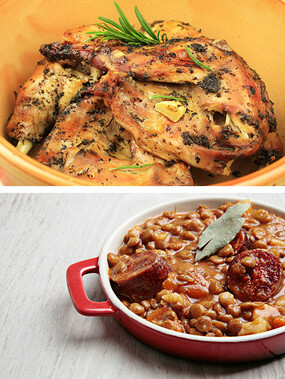 Either way, the recipes for all of these items are simple, affordable and incredibly tasty. Why not give it a go? Sea salt – and a lot of it! The first step is as simple as boiling the new potatoes for 20 minutes – except you need to add sea salt until the potatoes float. This may feel like too much salt, but this is the way the Canarians have done it for generations. Once cooked, drain the majority of the water from the pot and cover the cooked potatoes with a layer of salt. Turn down the heat of the hob, and gently toss the potatoes so that they become coated in crystallised salt. Once you're happy that the potatoes are adequately salted, take the pot away from the heat and cover with a tea-towel for 5 minutes – this gives the potatoes that lovely wrinkled texture. To make, it couldn't be easier. Blend everything except the coriander and olive oil together until it's all finely chopped. Then, chop the coriander leaves by hand before slowing combining them with the mixture, gently adding the olive oil along the way.